Dimensions 0.40 by 6 by 9 in. Amazon.com description: Product Description: The story of The Trial's publication is almost as fascinating as the novel itself. Kafka intended his parable of alienation in a mysterious bureaucracy to be burned, along with the rest of his diaries and manuscripts, after his death in 1924. Yet his friend Max Brod pressed forward to prepare The Trial and the rest of his papers for publication. With Nick Gill (other contributor) | from Oberon Books Ltd (April 12, 2016); titled "The Trial"
About: Josef K’s thirtieth birthday begins with a knock on his door from two sinister agents. from Createspace Independent Pub (December 7, 2015); titled "The Trial"
from Createspace Independent Pub (November 23, 2015); titled "The Trial"
from Createspace Independent Pub (November 11, 2015); titled "The Trial"
from Createspace Independent Pub (September 15, 2015); titled "The Trial"
from Createspace Independent Pub (July 18, 2015); titled "The Trial"
About: The Trial is a novel written by Franz Kafka in 1914 and 1915 but not published until 1925.
from Createspace Independent Pub (July 16, 2015); titled "The Trial"
About: The Trial (German: Der Process) is a novel by Franz Kafka about a character named Josef K.
from Createspace Independent Pub (June 12, 2015); titled "The Trial"
About: The Trial is a novel written by Franz Kafka in 1914.
from Createspace Independent Pub (June 10, 2015); titled "The Trial"
About: On his thirtieth birthday, the chief financial officer of a bank, Josef K.
from Createspace Independent Pub (April 24, 2015); titled "The Trial"
With David Wyllie (other contributor) | Reprint edition from Roads Pub (November 20, 2014); titled "The Trial"
About: On his thirtieth birthday, Josef K.
from Createspace Independent Pub (November 2, 2014); titled "The Trial"
About: "The Trial" (original German title: "Der Process", later "Der Prozess", "Der Proceß" and "Der Prozeß") is a novel written by Franz Kafka in 1914 and 1915 but not published until 1925.
from Createspace Independent Pub (July 26, 2014); titled "The Trial"
About: The Trial is one of the most important novels of the twentieth century. from Createspace Independent Pub (June 30, 2014); titled "The Trial"
About: The terrifying tale of Joseph K, a respectable functionary in a bank, who is suddenly arrested and must defend his innocence against a charge about which he can get no information. from Createspace Independent Pub (June 21, 2014); titled "The Trial"
About: The Trial (original German title: Der Process later Der Prozess, Der Proceß and Der Prozeß) is a novel written by Franz Kafka in 1914 and 1915 but not published until 1925.
from Createspace Independent Pub (May 1, 2014); titled "The Trial"
from Createspace Independent Pub (September 7, 2013); titled "The Trial"
from Createspace Independent Pub (May 17, 2013); titled "The Trial"
About: The Trial is a novel by Franz Kafka. from Createspace Independent Pub (March 28, 2013); titled "The Trial"
from Createspace Independent Pub (October 12, 2012); titled "The Trial"
With David Wyllie (other contributor) | Italian edition edition from Createspace Independent Pub (September 12, 2011); titled "The Trial"
About: Kafka's masterpiece and best-known work, The Trial tells the story of a man arrested and prosecuted by a remote, inaccessible authority, with the nature of his crime not revealed to him or to the reader. from Createspace Independent Pub (November 19, 2010); titled "The Trial"
About: The story of The Trial's publication is almost as fascinating as the novel itself. 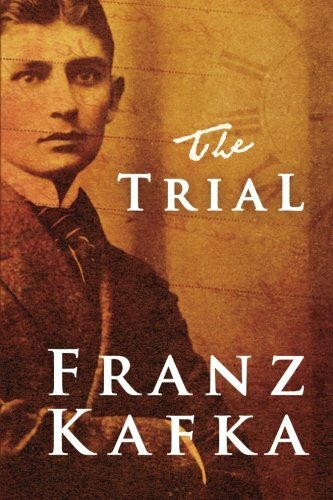 from Gardners Books (August 20, 2010); titled "The Trial"
About: From its gripping first sentence onward, this novel exemplifies the term "Kafkaesque. from Createspace Independent Pub (April 1, 2010); titled "The Trial"
With Non (other contributor) | from Schocken Books (September 1, 2009); titled "The Trial"
About: Written in 1914, The Trial is one of the most important novels of the twentieth century: the terrifying tale of Josef K.
from Lightning Source Inc (September 30, 2008); titled "The Trial"
Large print edition from Read How You Want.Com (December 1, 2006); titled "The Trial"
About: ReadHowYouWant publishes a wide variety of best selling books in Large and Super Large fonts in partnership with leading publishers. Unabridged edition from Findaway World Llc (May 1, 2008); titled "The Trial"
With Geoffrey Howard (other contributor) | Unabridged edition from Findaway World Llc (May 1, 2008); titled "The Trial"
With Mike Mitchell (other contributor), Scott Brick (other contributor) | Unabridged edition from Brilliance Audio (July 1, 2013); titled "The Trial"
About: ‘Someone must have been telling tales about Josef K.
With Mike Mitchell (other contributor), Scott Brick (other contributor) | Mp3 una edition from Brilliance Audio (July 1, 2013); titled "The Trial"
from Demco Media (April 1, 1995); titled "The Trial"
With David Wyllie (other contributor) | Reprint edition from Turtleback Books (July 22, 2009); titled "The Trial"
With Willa Muir, Edwin Muir (other contributor) | Reprint edition from Everymans Library (July 1, 1992); titled "The Trial"
from Createspace Independent Pub (March 2, 2014); titled "The Trial"
About: The Trial Franz Kafka The Trial, original German title: Der Process, is a novel written by Franz Kafka in 1914 and 1915 but not published until 1925. With Chantal Montellier (other contributor), David Zane Mairowitz (other contributor) | from Sterling Pub Co Inc (April 15, 2008); titled "The Trial"
About: Someone must have been slandering Joseph K, because one morning, without having done anything wrong, he was suddenly arrested. Large print edition from Echo Library (November 30, 2006); titled "The Trial"
About: This large print title is set in Tiresias 16pt font as recommended by the RNIB. from Echo Library (May 30, 2006); titled "The Trial"
About: Written in 1914, The Trial is the terrifying tale of Josef K.
With Willa Muir, Edwin Muir, George Steiner | from Schocken Books (April 1, 1995); titled "The Trial"
from Pan Books Ltd (November 1, 1987); titled "The Trial"
from Schocken Books (January 1, 1987); titled "The Trial"
With Mike Mitchell (other contributor), Scott Brick (other contributor) | Mp3 una edition from Brilliance Audio (August 25, 2015); titled "The Trial"
About: Rumis Spiritual Verses is the greatest mystical poem in Islamic culture and of all time. With Geoffrey Howard (other contributor) | Unabridged edition from Blackstone Audio Inc (January 1, 2000); titled "The Trial"
With Geoffrey Howard (other contributor) | Unabridged edition from Blackstone Audio Inc (June 1, 1999); titled "The Trial"
With Breon Mitchell (other contributor), Geoffrey Howard (other contributor) | Unabridged edition from Blackstone Audio Inc (March 1, 1999); titled "The Trial"